Perhaps this sounds familiar. You’re at a holiday party. Deep red fruit punch boxes are served. The children help themselves to a plate of bright yellow, blue and green cupcakes, and a bowl of red and green candies. Then, suddenly, one of the children starts running around like a jackrabbit. You chalk it up to too much sugar. But maybe it was too much artificial food color. For over 150 years, food companies have been putting artificial colors in their products to enhance their visual appeal. At the turn of the twentieth century there were more than 700 food color ingredients that were permitted in food. In 1906, the Pure Food and Drug Act, reduced that down to 7. And although the laws have evolved since then, researchers have been questioning the link between ADHD in children and artificial food colors for decades. By law, all packaged foods must comply with the FDA’s list of approved artificial food colors. But concerns still exist. Many studies have shown no link between hyperactivity in children and synthetic food colors. But a 2007 study in the UK did find a link between them. And in the U.S., a 2012 meta analysis of studies on the topic concluded that color additives have an effect on hyperactive behavior in children. Some researchers simply believe that some children are more sensitive to chemical food dyes than others. Since we really don’t need artificial food colors, you can begin removing them from your family’s diet. Some of the big packaged food companies have already started. In 2016, Kraft removed artificial color and flavors from its famous Macaroni and Cheese. And General Mills has removed most of the phony colors from their breakfast cereals. How did they do it? These companies found natural, plant-based food colors to use as alternatives. Now, you can use these plant-based colors in your own kitchen. 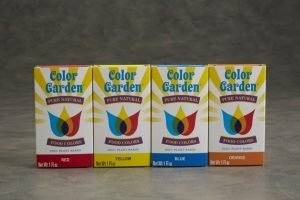 Brands such as Color Garden offer 100% plant-based food colors. Their beautiful red is made from beets, and their blue is made from red cabbage. By shopping at natural markets, reading ingredients statements and looking at food companies’ web sites, you can easily remove the chemical food colors your family consumes. Plant-based food colors are a good alternative to chemical food dyes which may cause hyperactivity in children.